It provides full and vital nutrition for the dynamic people. This nutritive power is the result of many years of research that gives a maximum morning impulse and freshness for the body. The treasures of this nutritive power are the Spirulina and the Chlorella micro-algae that kept in their natural form. The Spirulina is full with vitamins, minerals, enzymes, trace elements, and fundamental Amino acids. It will prepare the body for the daily strain, school, tests, work, every day stress, etc. The Chlorella advances and protects the body from the environment's contamination. The tropical taste revolution comes from the added natural ingredients. First of all, the Vitamin C sensation, the Accerola Cherry. This fruit contains 100 times more Vitamin C, then the orange. The Vitamin C energizes the body and engages the free radicals. The Papaya is also more then a flavouring ingredient. The Papaya contains Papain Enzyme that helps the metabolism, and provides excellent condition. 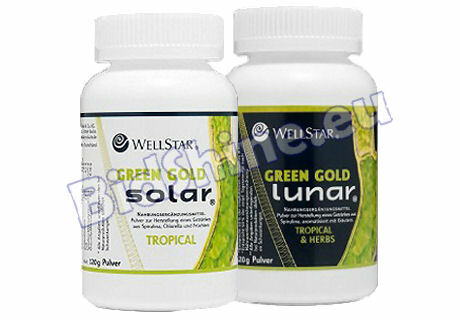 The Green Gold Lunar provides the nutrition that the body has lost during a hard day. Contributes to the relaxing time after these days and helps to restore the balance of the body and the mind. Besides, of the vital Spirulina, it contains virtuous plants that well known for Centuries. Especially, the Sage is a multi talent. Calms and cleans the body. Further more, the essential oils help in the self-cleaning process of the respiratory tracts. The Balm and the Thyme are harmonizing and regenerating the mind. The dried apple next to the natural form of plants has high vitamin content and rich in fiber. Together they give all the required nutrition to regenerate the body at night. Together they give a compounded, beneficial, harmonious and tasty drink. The result of regular takings will increase the resisting capability of the body that will show in couple of days. Provides better, more relaxing sleep while gives all the necessary nutrition and energy for the next days. The ISO 9001 Quality Management Standard proves that these products are a highest quality, contain only natural ingredients and is preservative free. Every product is under quality control and guaranteed by the German LEFO - Institution. It is recommended to use these together! If you don't know how to take them, please request for an instruction here!